In Paris this fall, we spent a truly delicious day cooking with Bénédicte Mesny at The Parisian Kitchen. 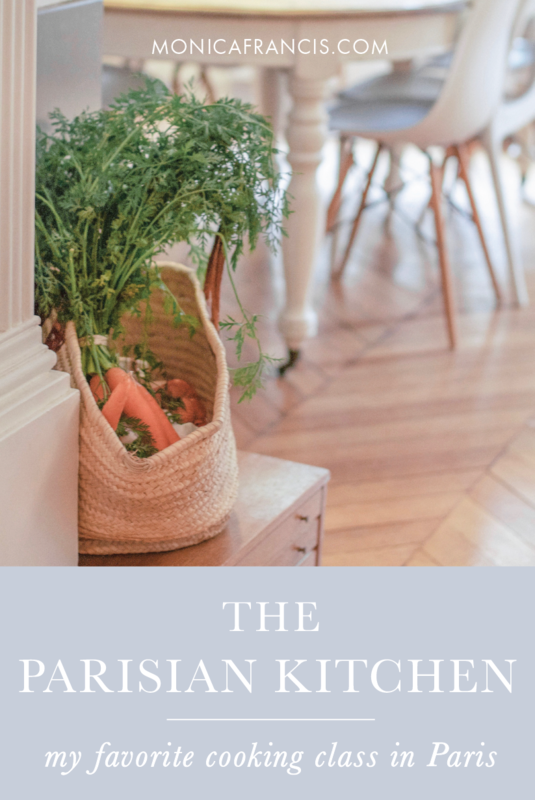 Her cooking classes take place in her own gorgeous Haussmann flat in the 17th arrondissement, an apartment that's just as warm and charming as Bénédicte herself. We chose the market tour and cooking class, but her pastry class is already on my wishlist for my next visit. Our class began at 10am with tea, coffee, and madeleines (homemade, of course) while we got acquainted with our cooking classmates. Next we visited Marché de Lévis, where Bénédicte guided us through the market - the cheesemonger, the butcher, the fruit and vegetable stands - collecting everything we would need for our meal, and giving us plenty of good advice along the way. Then, back to the apartment to start on the cooking. Together we prepared a cheese soufflé (my favorite part of the meal), meat with a red wine sauce and caramelized vegetables, and a tarte tatin (apple tart) for dessert. With everyone taking on different tasks the meal seemed to come together in no time at all - though I'm sure we spent at least an hour chopping, stirring and learning. We enjoyed a glass of champagne while Bénédicte set a beautiful table, then all sat down to enjoy our wonderful meal and good company. The day really could not have been more perfect - the next time you're in Paris, do yourself the favor of booking a class - I certainly will!